Sergeant Arthur Jones of the 2nd Battalion, King's Own Royal Lancaster Regiment, was extra-regimentally employed during the South African War to the Atlantic island of St. Helena to guard Boer Prisoners of War. 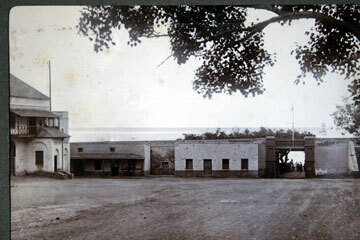 These photographs are from an album he owned. 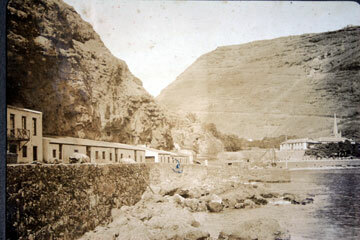 During the South African 'Boer War' 1899-1902 the Atlantic Island of St. Helena was used as a Prisoner of War camp. 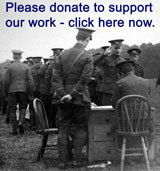 Over five thousand Boer POWs were held on the island, camped on 'Deadwood Plain' and 'Broad Bottom'. The first 514 POWs landed at St. Helena from the 'SS Milwaukee' on 14th April 1900, including General and Mrs Cronje and his military staff. The General and his wife were accommodated in 'Kent Cottage'. Further POWs arrived, 394 on board 'Lake Erie' in April 1900, 1099 on board 'Bavarian' on 1st May 1900, and the last ship was the 'Mongolian' which arrived with 649 Prisoners of War on 3rd February 1901. More arrived in 1902 with 1050 on board the 'Orient' and others on board the 'Britannia'. Peace came in June 1902 and this was followed with the return of the POWs, the first of which on board the 'Canada' on 26th June 1902. Sergeant Arthur Jones, number 4507, of the 2nd Battalion, King's Own Royal Lancaster Regiment, was 'extra-regimentally employed' to St. Helena between 20th February 1901 and 3rd November 1902. 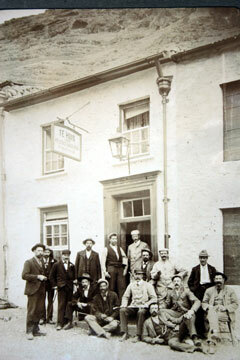 He obtained this album of photographs which includes over one hundred images. 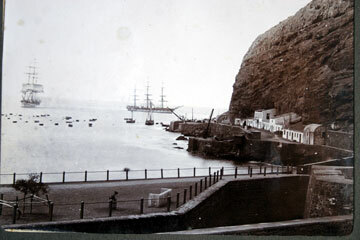 View of Jamestown, St. Helena from off shore, including St. James' Church. 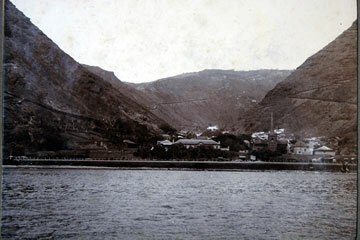 View of Jamestown, St. Helena from off shore. View out to sea from Jamestown, St. Helena. 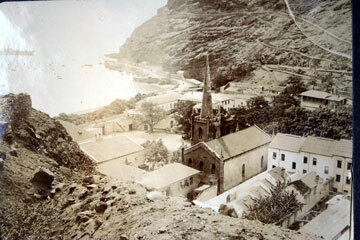 View of Jamestown, St. Helena, including St. James' Church. 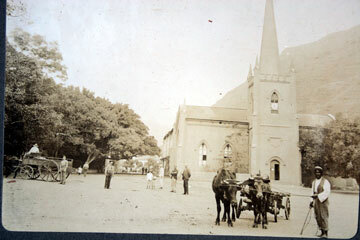 St. James' Church, Jamestown, St. Helena. View of Defensive Wall at Jamestown, St. Helena. 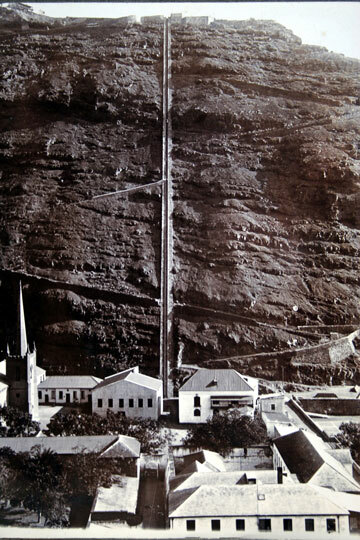 'Jacob's Ladder', Ladder Hill, Jamestown, St. Helena. 699 steps lead up to the fort on the top of the hill. 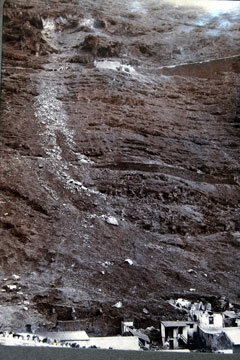 View of steep slope to the side of Jamestown, St. Helena. 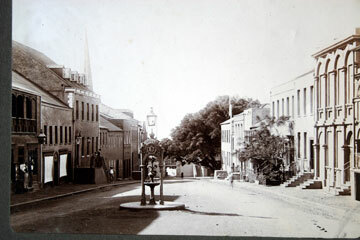 Main street of Jamestown, St. Helena, including 'Jackson's Chemist' and the Soldiers and Sailors Institute. Group outside 'Te Huis', Jamestown, St. Helena.